Did your car have a terrible accident? Or someone just played a bad prank with you? Whatever the problem is, if your car’s side windows has been damaged, you’ve come to the absolutely right place. Fast car glass is a Manchester car glass repairing service specializing in side window repair that offers you the real value for your money. The side windows repair services we at fast car glass offer are not just speedy but also of high quality. Fast car glass is not like other Manchester car glass repairing services you’ll encounter. It is so much better. How you ask? You must be wondering why we are the best. After all every Manchester car glass repair shop out there claims the same thing doesn’t it? So why believe Fast Car Glass? You have the absolute right to ask this question. And we’re going to answer it for you. Fast car glass is nothing like those other shops out there who’re providing similar services. Most of the shops you’ll find will claim to provide you with a very speedy service. But is that all you’re looking for? Absolutely not. Through our years of experience in the Manchester glass repair industry, we’ve discovered that when a customer walks into our store, he is not only looking for a speedy service but also a quality service. To an average customer, quality of the service often matters a lot more than speed. You will find tons of Manchester car glass repair shops claiming to have you on your way within half an hour to 45 minutes. But do you think they will be doing as good a job as well? Absolutely not! They will do whatever they can to stick a new windshield on your car and have you on your way within the time they claim. Quality does not matter to them. But to an average customer, it does more than the speed of the job. This is why the services we provide at Fast car glass are the best among all competitors. The service we are offering is not just of high quality but also of speed. Make an appointment with Fast Car Glass and visit Fast Car Glass at the designated time. We can repair your car’s windshield within an hour. This means that within an hour, you can come with your car and be on your with a brand new windshield. Although it is highly recommended by our extremely skilled technicians that you don’t drive the car for at least one to two hours after the glass is repaired, it is completely at your discretion. The waiting time only allows the repaired side window to be settled perfectly and the solution to dry out. This allows for a more durable fixture which is likely to not cause you any problems throughout the life of your car, unless of course your side window is damaged due to some accident again. In the case where you do decide to drive your car right after the side window is repaired, we highly recommend you to drive with caution and very slowly in order to minimize any bumps that your might face because bumps might cause the side window to be displaced from its ideal position which in turn may not be as durable. 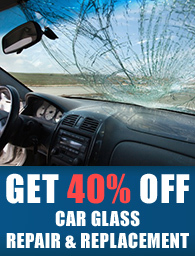 Call Fast Car Glass right away to book your appointment with us.